Does anyone have any information or opinions on the federal government’s recent cuts to the Trade Routes and the PromArt programs? Some are saying this is a vicious and sweeping attack on Canada’s culture industries. Here’s a Globe and Mail primer on the cuts: Ottawa axes second arts subsidy in two weeks. What does all this mean? What should we do? 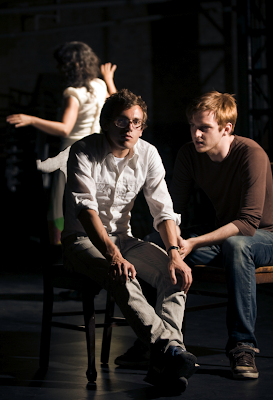 A press still for One Reed Theatre's (never underestimate) The Power at SummerWorks. Today's the last day to catch some SummerWorks action. Does anyone have any recommendations? Funny SummerWorks stories? Top picks? Given the small sample group, this is hardly conclusive polling. Still, it’s heartening to see a front runner emerge – especially given theatre’s current challenges communicating its value proposition to the non-theatregoing public. Incidentally, the phrase “We need it to see ourselves” is a direct lift from Daniel MacIvor’s “10 questions” interview, here. American monologuist and regional theatre reform advocate Mike Daisey has thrown down a blistering response to Theatre Communications Group executive director Teresa Eyring’s How Theatre Saved America, which was published in the current issue of American Theatre. University of North Carolina drama professor and oft-quoted theatre blogger Scott Walters agrees enthusiastically with the suggestion, here. What do you think? 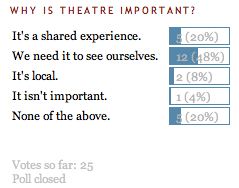 Are theatre’s regional institutions looking out for the artists? Or are they simply working to preserve their own outdated apparatus?